You can avail this package for local city usages at our portal anytime, anywhere. The Local Full Day service will be available for a variety of local trips including sightseeing, shopping, attending meetings, seminars, visiting hospitals, and a lot more. For those looking for a mini package can opt for half day hire service. This is a local city tour package offered for Airport Transfer in Amritsar, Car rental service for Marriage, party and event, Corporate Cab Rental in Amritsar, Railway Transfer, visiting hospitals and a lot more. Our chauffeurs will reach at the appointed destination in time. At My Taxi India, we ensure exclusive packages for outstation travel. These packages have been designed for a variety of tour choices such as weekend getaways, trip with friends, excursions, and family leisure trip outside the city limits. The package has been designed for specific tour requirements and budget of customers. Here, we can also arrange for group packages from Amritsar to places nearby. The cars sent across will accommodate group size to ensure maximum convenience. The trip service is a typical to and fro provision offered in Amritsar for our esteemed clients. The service is also available for multiple destinations from Amritsar. This is a special package designed to cater to one way drop to traveller’s destinations from Amritsar. The package has been designed comfortable, pleasant, and safe visits to more than one city within a fixed period of time. We also offer special Amritsar city sightseeing tours and any other customized cab rental packages. 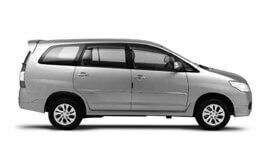 At My Taxi India, we guarantee the unsurpassed car rental services in Amritsar at highly affordable rates. Amritsar experiences a mixed climate. Months of April to August, are usually very hot and dry. The temperature may rise to an extreme of about 40° C. Monsoon season falls during the months June to September. During this period, the city gets extremely humid and sultry. Winter in Amritsar lasts from November to the end of March. The lowest temperature during winter may touch to 4°C. As per the 2011 census, Amritsar municipality had a population of 1,132,76. The major commercial activities in Amritsar include tourism, farm produce, carpets and fabrics, handicrafts, service trades, and light engineering. The city is also widely revered for its rich cuisine and culture. Amritsar is also referred to as the holy city in the state of Punjab, India. The name of the city has been derived from the name of the pool situated around the Golden Temple (Harmandir Sahib). It means "holy pool of nectar". It is actual spiritual and cultural centre of the Sikh religion. Golden Temple (Harmander Sahib) is a major tourist place in Amritsar city. Located in the holy city of the Sikhs, the Golden temple is famous for its elegant full golden dome; it is one of the most consecrated pilgrim spots for Sikhs. Other important tourist places in the city include Durgiana Temple (Lakshmi Narain Temple), Wagah Border, Jallian Wala Bagh, Ram Bagh, Ram Tirath, Pul Kanjari, Samadhi of Guru Angad Dev Ji, Jama Masjid Khairuddin, Samadh of Shravan, Khoo Kalyanwala, and The Historical Banyan Tree (Shaheedi Bohr).